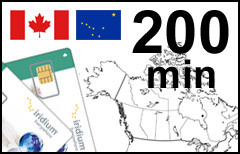 The Iridium Northern Lights Plan provides discounted airtime rates for customers using Iridium satellite phones in Canada and Alaska. No monthly fees, no additional charges, no credit checks, no security deposits, valid for 6 months! Geographic restrictions. Iridium Northern Lights subscribers can place outgoing calls and send text messages ONLY from the territory of Alaska and Canada, including 12 nautical miles into coastal waters. It WILL NOT work for outgoing calls anywhere else. Incoming calls and messages can be received throughout the entire Iridium coverage. Calls to overseas US territories and Hawaii are billed at $3.20/min. The account can be refilled with a new Northern Lights voucher as often and as many times as needed with all unused minutes to be rolled over. However, the validity time will not combine, so the maximum validity of available minutes cannot exceed 6 months. Note: Do not purchase a new plan on this page if you need to add more minutes or extend validity of your existing Iridium account with SATTRANS. Buy a new Iridium airtime voucher instead.